Secretary-General António Guterres launched the Action for Peacekeeping initiative (A4P) in March 2018 to galvanize member states to commit to peacekeeping and to translate statements of high-level political support into concrete actions. Since then, member states have signed a “Declaration of Shared Commitments on UN Peacekeeping Operations” in which they agree to adapt peacekeeping operations to meet contemporary challenges. But will this political consensus lead to actual change? 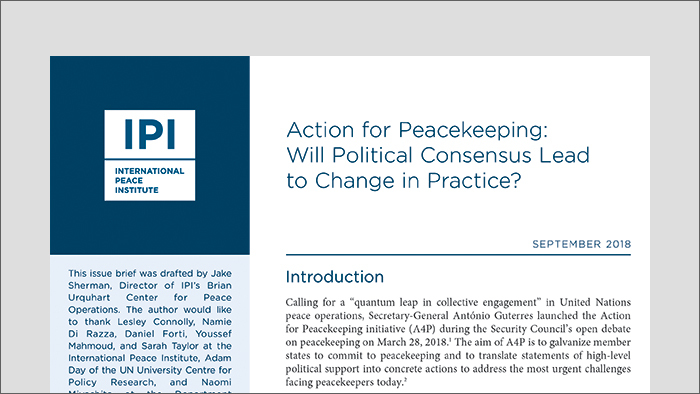 This issue brief assesses the political declaration across seven themes: political solutions, protection, safety and security, performance, partnerships, sustaining peace, and conduct of personnel. It argues that while some of member states’ commitments break new ground, many only reaffirm past agreements—and all require more concrete follow-up mechanisms. Ultimately, the success of the Action for Peacekeeping initiative depends on whether member states and the Secretariat honor their commitments and whether these commitments enable peace operations to help end conflicts and deliver sustainable peace.